That is, a call to a method named each. With almost everything being a method call, the speed at which we can execute these calls becomes very important if you want to have a high performance Ruby implementation. This article is going to talk about how the new Truffle backend in JRuby implements a very high performance method dispatch system on top the JVM. In fact I’ll show you that it’s so efficient that with important types like Fixnum we entirely optimize away the method call and how a call to something like Fixnum#+ becomes just a few inline instructions. You won’t need any deep technical understanding of JRuby, Java, the JVM or Truffle to follow this article. I’ll explain all the concepts we build on as I go. Hopefully you’ll enjoy some of the technical depth, even if you don’t understand it all. As method dispatch is such an important part of a JRuby+Truffle, seeing how it works will give you a good overview of how Truffle in general works. If you want some more background on the Truffle backed in JRuby there is an announcement blog post and a wiki page with lots of pointers to more information. If you aren’t using those tools, follow the instructions on the JRuby Truffle wiki page to get started. All Ruby implementations work out which method to call in the same way, using the same method lookup algorithm. For a clear description of how we do this, see the excellent book by Pat Shaughnessy, Ruby Under a Microscope. For a given receiver object on which we are calling the method, we first look in the object’s class. If we don’t find the method there, we look in the superclass of that class, then the superclass of the superclass and so on. Metaclasses, included modules and so on fit into the search algorithm as well but we’ll keep it simple. At some point we’ll either find the method to call, or we’ll resort to calling #method_missing instead. Even based on that simplified description, you can imagine the complexity of the method lookup algorithm. All Ruby implementations store the methods in each class in some kind of hash table, so each level of the lookup is a hash lookup. Hash table lookups can be fast, but if everything you do in your program ended up being a hash lookup, it’s still going to make your program very slow. To solve that we don’t do the method lookup each time we call a method. Instead we predict that the method we called last time is likely going to be same method we want the next time we make that call and cache it to use it again. The most basic type of method cache is a global one. For example, MRI has a global hash of pairs of classes and method names to the methods. At a method call it can lookup just once in this global cache and avoid possibly having to make repeated lookups in multiple classes. The problem with a global cache is that it still involves a lookup - a lookup in the cache hash. If we had a single one-entry cache per method call in your program we wouldn’t need to lookup in anything, we’d just need to read the value. This is called an inline cache - because the cache is inline as part of the call instruction. Ruby is a very dynamic language - methods can be added, removed or redefined at any point in a program. This means that the methods that we cached for a particular class and name might have become wrong. This can happen at absolutely any point in your program. When it does, the caches we’ve made might become invalid. A global cache is a simple case - we can just clear the whole thing when methods change. Inline caches are more complicated, as we first have to find all the inline caches in the program, and ideally we only want to clear those that are actually now invalid. Method lookup works exactly the same in JRuby+Truffle as it does in all the other implementations, using the standard lookup algorithm. However our implementation of caches and dispatch is pretty unique - we implement a system of polymorphic inline caches via abstract syntax tree rewriting with dynamic deoptimization for invalidation. Some of those techniques might sound very advanced but we’ll show how Truffle makes them very straightforward. JRuby+Truffle parses your Ruby code (using JRuby’s parser) into a tree of nodes - an abstract syntax tree. Unlike other implementations this is as far as we go - we don’t explicitly emit bytecode or machine code. Our implementation is always interpreting the AST, and Truffle and Graal convert this to machine code on our behalf. When your Ruby is read by JRuby+Truffle we create a RubyCallNode for each call site - location where you call a method - in your code. 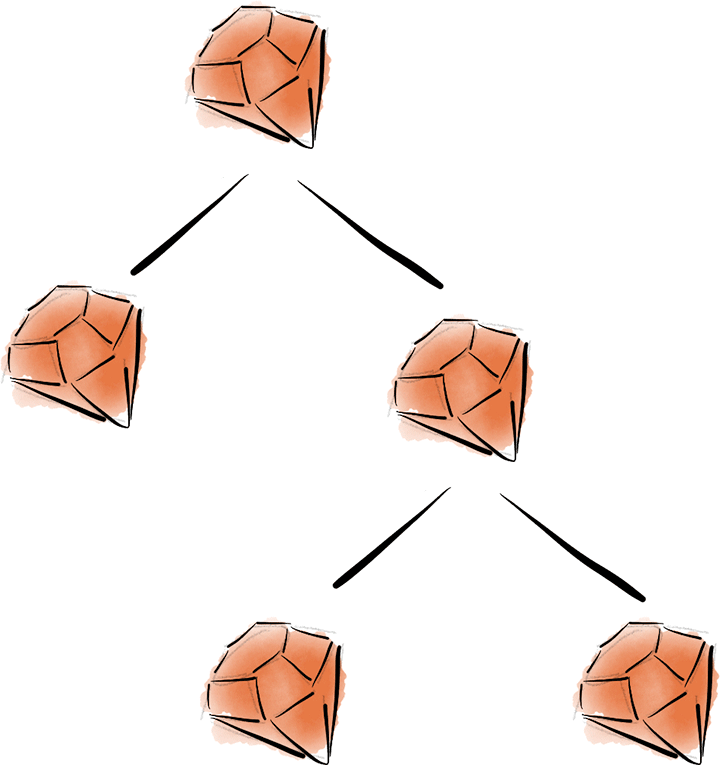 The RubyCallNode has the name of the method you want to call, any arguments and maybe a block. It executes these and then calls the first of one or more dispatch nodes. Each CachedDispatchNode is designed to handle a single class of receiver. They store the class they’re designed to handle and the method they call, making an single inline cache entry. We’ve already executed the receiver, the block and the arguments. This CachedDispatchNode then just checks that this is the class we were expecting (we talk about LookupNode rather than class to support the complex Ruby object model). If it wasn’t what we expected it tries the next entry in the cache - the next DispatchNode in the chain. We then check the class hasn’t been modified since we created the cache entry. This is like how MRI checks the version number, but we’re using an object rather than a version number. We don’t compare numbers, we just see if the object is still marked as valid by calling check, which throws an exception if it isn’t valid. We then simply call the method as normal. So the only work we have to do before calling the method is one reference comparison on that LookupNode, and a call to check on this Assumption object. Later on I’ll show how both of these checks are entirely removed by the JIT compiler. If your call site only ever sees one class of object you’ll have only one dispatch node, if you have more you’ll have a chain of them each handling calls to a different class. That’s makes the inline cache polymorphic - it can handle more than one class. There’s a special DispatchNode called UninitializedDispatchNode that is always at the end of the chain. Instead of expecting a particular class and caching a method, this node runs the lookup algorithm and replaces itself with a new DispatchNode that caches the result of that lookup. The first time this code runs we’ll go straight to the UninitializedDispatchNode. That will do full method lookup. We’ll find that the method we want is Fixnum#+. The uninitialized node will replace itself with a new dispatch node that remembers that when the receiver is a Fixnum, the method we want to call is Fixnum#+. The UninitializedDispatchNode will follow that new node in the chain, ready to handle different classes. TraceTruffleExpansion means to list all the Java methods involved in interpreting the Ruby method. Those CachedDispatchNodes at some point call another Ruby method. Thanks to caching, that can always be the same method, but we’re still doing the work of making a call, which means managing arguments and a return value. The other disadvantage is that a lot of compiler optimisations don’t work across method boundaries, as methods are compiled separately. Since we already worked out that we’re normally going to be calling just one method that we cached, we might as well put the code for the method directly at the call site, especially if the method is something as simple as Fixnum#+. Truffle inlines methods by taking the AST that represents the method we are inlining, and simply copying it and making it a child of the dispatch node. The data structures we’ve illustrated above look quite complicated. Even a simple call is going to involved multiple Java objects to implement it, and to execute it we’re going to have to go through methods in CallNode and DisaptchNode. So we’re trying to create a fast implementation of method calls, but it’s already using multiple Java method calls before we actually call the Ruby method. This is where the Graal compiler comes in. Graal is a JIT compiler for Java, implemented in Java. This isn’t an exercise for the sake it - by implementing the JIT in Java we can provide a full interface to the program it is compiling, rather than just the one way interface of sending bytecode. Talking to a compiler on its terms is complicated, so the Truffle framework does most of the work on our behalf, and we just have to specify a few extra commands to control how it compiles our Ruby interpreter. The first thing to know about Truffle is that it generates a single machine code method for each Ruby method. The technique we use is called partial evaluation, but if you want you can just think about it as aggressive inlining. In fact Truffle will continue to inline until we tell it to stop. When we inline, Java method calls disappear and it’s as if the code was all written in one big method, so the fact that our Ruby method calls involve multiple Java method calls isn’t a problem. Lets take a look at the assembly generated for a real Ruby method. We run the method in a loop so that the JIT will be run. We’re not doing anything with the result, but like all Ruby interpreters, we’re not quite strong enough yet to completely elide the computation - Ruby has complicated side effect semantics, so this is non-trivial. We’ll run this using the Truffle backend, and we’ll ask the JVM to print out machine code as it’s generated. UnlockDiagnosticVMOptions turns on some special JVM options that are normally hidden to avoid confusion. CompileCommand=print turns on printing machine code, and executeHelper refers to an internal method in Graal that is always the starting point of compilation. If you don’t know x86_64 machine code, just look at the instruction names. There’s an add and a sub instruction, which directly correspond to the + and - operations that we wrote. These instructions were in the methods Fixnum#+ and Fixnum#-, but because they’re so simple we’ve decided to inline them at the point where they’re called. add and sub instructions work on 32 bit integers, so we’ve also detected that we’ve only called this method with Fixnum types and specialised for just that case. After each of the instructions there’s a jo instruction. That stands for jump if overflowed (jump is like goto). This is because if a result can’t fit in a Fixnum, Ruby will automatically convert to a Bignum for you. The code that actually handles that is somewhere else that we jump to, because it rarely happens. Following the add and sub we have cmp (compare) and jl and jg (jump if less, and jump if greater). This checks if the value fits into a Fixnum, which is actually slightly smaller than a 32 bit integer, so we need to do a check as well as handling the overflow. This short sequence of machine code shows everything that we’ve talked about so far. We’ve inlined the Fixnum#+ and Fixnum#- methods into the add_and_subtract method. We’ve also gotten rid of all the Java method boundaries. We talked earlier about two checks, and there’s no sign of them anymore. We could get rid of the check that the class was what the cache expected, because the local variables have been typed as Fixnum from the start of the method. We’ve also gotten rid of the check method call on the Assumption object. I’ll explain how we did that in the next section. The result is that we’ve produced machine code that looks like code that I would write if I were translating Ruby to x86_64 by hand. This is what makes the Truffle backend in JRuby fast. Look for the method test.method__0$RUBY$add_and_subtract. You can find the add and sub instructions, but you’ll find they’re about 40 instructions apart. The instructions between deal with boxing and bookkeeping of the invokedynamic system. Look for the method _X_Object#add_and_subtract. Again we’ll find add and sub, and in this case they’re a lot closer together. Around them is code for handling tagging - that is, packing a Fixnum value into a pointer. We’ve explained how method caches are created, how we get rid of the expensive Java method calls involved in all these data structures, and how we’ve generated minimal machine code, but what happens when methods are added, removed or redefined? The approach we use in the Truffle backend looks similar to MRI. Truffle provides a utility for doing this kind of thing, called the Assumption class. An Assumption object is a bit like a version number, but it’s binary - either it’s valid or not. Instead of storing a number in the inline cache, and increasing it when the cache is invalidated, we store the Assumption object when we create the cache, and we make it as invalid and create a new object when the cache is invalidated. However when I showed the machine code above, there was no mention of an Assumption object, so where has it gone? When your Ruby method is compiled, Truffle removes all references to the Assumption objects. Instead, when we want to clear the cache, we mark the Assumption objects as being invalid and deoptimize all the machine code that used those Assumption objects. That means the runtime goes in and stops the machine code from running, and puts us back in the interpreter, where we will update the cache. So instead of actively checking that a cache is still valid, we stop machine code that has an invalid cache. We go from a lazy check to an active one, and one that has no overhead while the cache is still valid. That’s exactly what we need for a fast implementation of method dispatch - remove the cost from the fast path, and put it onto the less common path. Going back to the machine code we showed, those jo instructions which deal with uncommon cases like overflow also cause deoptimization. In general our approach to things which rarely happen is to not compile them, and to deoptimize if we actually encounter them. Looking at the simple example of add_and_subtract and following it all the way down into the generated machine code we’ve showed how Truffle and Graal allow us to produce a really efficient implementation of method dispatch for Ruby. We showed how the partial evaluation in Truffle removes Java method call overheads, how the type profiling and inlining allows us to use primitive machine instructions for operations on Ruby objects like Fixnum, and how the Assumption object removes the need to check that caches are still valid. There’s a lot of work going on behind the scenes in Truffle, Graal and the JVM to enable the techniques we’ve discussed, but the interfaces that Truffle provides makes using them easy. For example, the Assumption object has only two methods that you need to understand - check and invalidate, and that provides access to one of the most powerful techniques in the JVM, deoptimization. If you want to get involved in Truffle development in JRuby, or want to know more about what we’ve talked about, feel free to get in touch with me. Copyright © 2014 Chris Seaton.